Hello All, not sure if I'm posting in the correct category...Oh HAPPY DAY! Just got a call and an email from Virginia Classic Mustang saying that the Autolite Group 24 AGM repro batteries are going to ship in 2-3 weeks, they have been on back order for a long time it seems. They actually wouldn't accept any new orders. It's a bit expensive but gosh darn a great looking battery LOL. (08-21-2018, 06:04 AM)NOT A T5 Wrote: Hello All, not sure if I'm posting in the correct category...Oh HAPPY DAY! Just got a call and an email from Virginia Classic Mustang saying that the Autolite Group 24 AGM repro batteries are going to ship in 2-3 weeks, they have been on back order for a long time it seems. They actually wouldn't accept any new orders. It's a bit expensive but gosh darn a great looking battery LOL. I had one of those nice repro batteries in mine and when it crapped out about 6 months ago I tried to order one and could not get an order through. I was ready to drop the cash but could not find one and I really needed a battery NOW! I'm glad you are getting yours. I hated to toss that expensive good looking battery out. So, I got the "fake" cover and a "regular" battery (a great one) for a bit less money. Spray painted the white battery case black just for good measure and put the cover on it. Looks pretty good - especially once it is in the tray in the car! Whats the difference between the "group 27 and 24" batteries? (08-21-2018, 05:43 PM)icejawa Wrote: Whats the difference between the "group 27 and 24" batteries? Thanks, I'll look for a specific charger. I think the difference between 24 and 27 are more cranking amps and different sizes. If your battery crapped out after only 6 months you could have let whomever you bought it from know, there is warranty on them at least 36 months I believe. An Autolite cover is fine. Back in the 90's I had the same Autolite battery but with acid, no AGM back then, and it boiled over driving on the Autobahn coming back from a drive-in theater destroying a lot of chrome parts and such. Bad memories! (08-21-2018, 07:14 PM)NOT A T5 Wrote: Thanks, I'll look for a specific charger. I think the difference between 24 and 27 are more cranking amps and different sizes. If your battery crapped out after only 6 months you could have let whomever you bought it from know, there is warranty on them at least 36 months I believe. An Autolite cover is fine. 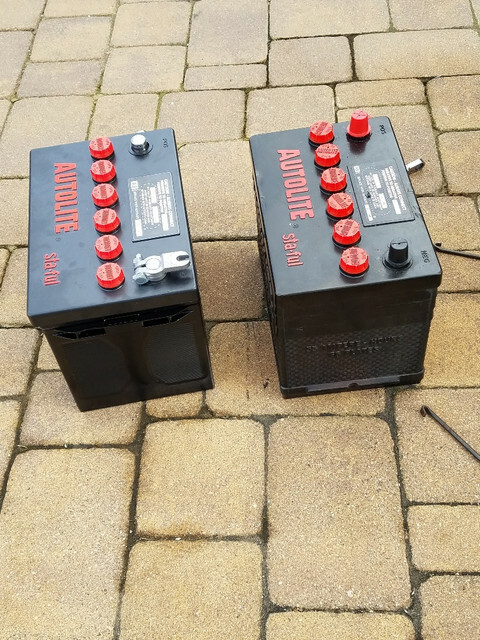 Back in the 90's I had the same Autolite battery but with acid, no AGM back then, and it boiled over driving on the Autobahn coming back from a drive-in theater destroying a lot of chrome parts and such. Bad memories! No, the battery crapped out about six months ago not after six months. I estimate it was about 5 years old as it was in the car when I first got it. Might have been older. It went through a lot. It was being undercharged by a bad alternator when I got the car and it pulled heavy duty because the car used to take a lot before it would crank over. I am very satisfied with that battery and its cool you got one. I wish I could have found one when I needed it as I would have gone that way. FYI...For people that want an electronic solid state regulator and dont want to buy a generic electronic one, take off the cover and replace it with the correct cover, Virginia Classic Mustangs now sells all electronic ones with the correct covers. These may have been around for a while but I had not seen them listed anywhere. I've switched over to an electronic regulator about 4 years ago. Like Chuck stated, in my case anyway my faulty voltage regulator boiled my battery. Sorry to hear your battery crapped out.